At least the year ended well on a personal note with the birth of our first child Murty. Up to that it was a tough year. We entered 2012 shortly after losing our niece to a long and rare illness. Throughout the year two good friends would also pass away - one of them after a long battle with cancer and another who fell suddenly and unexpectedly at an early age from a brain tumour. On the economic front -jobs are being lost, wages and services are being cut, people are emmigrating in their thousands. TV and radio is just one depressing conversation after another. God almighty, when did we allow money to have such power? Last year I set myself a goal of clearing my mortgage in one foul swoop. What a joke! I did take about 10k extra off it however and the year of entrepeneurial ideas has actually set me on course to set up a little business that I'll be announcing shortly, so maybe the crackpot scheme was worth putting out there afterall! Running-wise, this was a disappointing year. After having run a race a month in 2011 I managed to only run three races in the entire year so far (though I did set a 10k PB). I also slacked off considerably with my blogging (only 45 posts so far this year as opposed to 100+ in all years previous). For the past few months especially I have struggled to keep my fitness levels going. I've plodded away with three milers (and an unposted threadmill 5miler last Sunday), but it has really been a bad effort. So what's in store for 2013? For starters, a bit more discipline in the health department: I'm going to go around the year in 24pints again (though this time I'm also going to add 24 glasses of wine and 24different whiskies! - okay it's more like a party, but it's a disciplined party!). Secondly, I'm going to do a run a month once again... (and who knows, maybe a marathon? ), and thirdly, keep posted for my new business... it will be exciting to see how a new venture does in this recession! To all my blogging friends - have a happy Christmas and New Year full of running. Right, I'm usually the one that says 'what the hell are those Christmas ads doing on telly in November!'. However, we are 10 days into December, plus I've discovered that a great way to disguise an unhealthy liking for mince pies is to fake Christmas-itus! So, from now on I'm whistling 'White Christmas', donning a Santy hat and buying mince pies by the dozen. I've also discovered that our brand new stove (range) is ideal for heating those little parcels of flavour (of course I could use the microwave, but it wouldn't quite give the same pinch of anticipation while eating dinner!). Anyway, enough of the mince pie talk... after all, this is a 'running blog'! I managed another threadmill three miler today and felt a bit better than the last time out. I'm figuring on one more of these boring old internal runs and then it's out into the wonderful wild for a proper long run this weekend. I'll be fit for Santy! The little fella is beginning to smile. Is there any feeling better than having your infant son smile at you before you set off for work? At 7.30am this morning I looked into the cot to see if he was alright and there he was, happily lying there with his eyes open and his two little arms upstretched. And just as he noticed me he smiled the tinest bit! I did another three miles on the threadmill yesterday... it's true to say that I'm just hanging on to my fitness by the tiniest of threads, but it's something to grasp on to at least... perhaps this week will be the week. Perhaps. I hopped on to the threadmill for a three mile run yesterday. Now, you know that I don't like the threadmill but it does serve a purpose from time to time, and with the recent arrival of our first child Murty, it afforded me the chance to go three miles without moving away from the house! Actually, this was my first run since the birth of our little boy. The first two weeks of his life has meant a bit of adjusting in my own! I was actually a little afraid of the prospect of this run - would I be able for it? Had I fallen too far behind? As it turned out, I just ran it nice and easy and it was all fine. Another few of these and I should be back on track (or should I say, back on the road!). Next Sunday sees the return of the wonderful Leenane 5mile road race. I've done this a few times, and would love to be able to do it again on Sunday, but I'm not sure if we can juggle early parenthood around to facilitate the day out. A race like this would really get me back into the groove of things... so fingers crossed we can work it out. On the blog front: I've just noticed that I've crossed the 20,000 page view threshold! Hey hey, pop the bubbly! Great Reason for a Lay-Off! Just when I thought I was back in the running groove, my wife went into labour and our lives have changed completely... so welcome to the world little Murty. He was born last Friday morning (actually a week last Friday), at 10.40am, weighing just under 7lbs and bearing a significant resemblance to his Daddy! Mammy and child are both doing fantastically well. 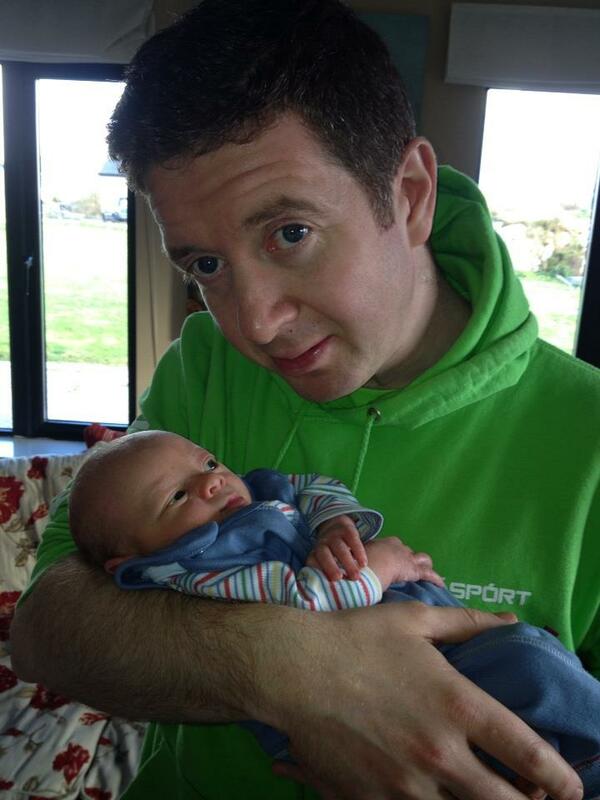 We're delighted with the little fella and completely smitten. Everything has been baby baby baby for the past eight days - I'm concious that I have to go for a run at some stage, but not just yet! Long Lay Off, back to 5 miles. It had been three weeks since last I ran. The longest lay off I've had for about three years. I don't know what happened really - I got a bit of a bug and just couldn't shrug it off, and felt like I didn't have the energy to go out running. With the result that I missed my October 13th 10k challenge - I'll have to reset my goals for this distance and find a race in December. I finally broke the duck yesterday with a five mile run around the village in the company of the 100 marathon man, Conor. Beautiful day it was for it too... I actually managed alright for about three miles and then struggled home the last two. Felt a bit zapped afterwards and just hope that it marks the end of whatever ails me... I'll need to keep fit now that we are so close to our baby's arrival (due date is actually today!). My wife hails from a village in County Louth called 'Stabannon'. It's a phonetical translation of the Irish 'Teach Bannain', meaning 'Bannon's House'. This Bannon fellow was most likely a big landowner (the land around these parts is exceptional). On Friday, we traveled across the country from our Conamara home to Stabannon for a family wedding - giving me the opportunity to run those less familiar routes (although they are getting more familiar with every trip). For the most part, last week was a poor training week for me. I felt a bit of fluey (man flu), so I didn't run at all until the end of the week when I finally got out for a five miler in Stabannon, and another four miler in the same place on Sunday. Friday's run brought me up past the old graveyard and onto the remnant's of a medieval castle which stands on the Old Ardee Road. I ran this steadily - fastest pace would have been around the 8.20 mark. There was frost on the ground when Benny and I got out on Sunday morning, which gave the countryside a lovely wintery feel. We were both a bit ropey after the wedding so we walked the first few minutes but once we got into our stride we felt good enough. The frost had all but melted away by the time we arrived back home and some of the other adults in the house were beginning to wake up. Yesterday, back in the comfort of my Conamara home, I got up on to the treadmill for a little more of the Coach Dion plan. This time I just ran two sets of 8 minutes at 7.5 pace, with a one minute recovery in between. It's only about three weeks now until 10k Chonamara, so I can't really say that I'm flying in training, but I'm hanging in there! The target is 48 minutes... hmmm. Fair play to Coach Dion... in commenting on my 10k ambitions he has done two things: 1) question whether it's really ambitious enough, and 2) given me a nice nudge to do some serious speedwork. On the first point: well, 48mins is not exactly Mo Farrah territory, but it would be a PB for me at this distance - if I can get to that for October 13th I might look at a year of reducing 10k PBs. On the second point: the Coach has suggested that I run around 3 times a week and for one of these runs that I do the following: 10 repeats for 60secs at faster than race pace, with 60 second rest in between, or else to run 8mins twice, or three times, at faster than race pace, with 60secs in between. 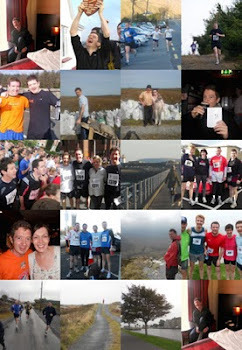 My sister got in contact today to inform me that she is entering the Conamara 10k, which takes place on October 13th. It's a big deal for her, as she is not a runner and will really be starting from scratch, so her declaration has spurred me on to a target of my own: to run that 10k in the 48 minute bracket (48.59mins will be acceptable!). My 10k PB to date is 50.06mins (set earlier on this year), so I will need to get out and train, train, train... My wife is due around October 23rd, so this would be a good time to hit a PB like that. This is an image from last year's Ger Kearney Run, as we walked with Mom on her home stretch. I need to get my camera fixed to start taking more snaps from this year's events! And finally, the last leg of my blog 'catch-up'! Folks thought I was mad in the head to get up at 8am on the morning after our arrival in Stabannon, following a three-day cycle across Ireland and a heavy night of celebration, to travel the two hour journey to Wexford for a four mile run - but how could I miss out on the Ger Kearney Memorial Run in Tombrack? This was the second year of this race, in what has to be one of the most picturesque parts of the country. The added incentive for me is that my younger brother, Richie, is married in the area - and actually a key organiser of the event. On arrival I was greeted by my mother and father, who had also journeyed south, and other brother Cormac who traveled from Dublin. It was an early start for this race - 11am, so the legs were still a bit stiff and sore after all of my cycling. Mom was once again going to walk the circuit and this year both Richie himself and his wife Deborah, were going to participate in the run. From the off, Cormac and I held back together and let the bulk of the field shoot on ahead at speeds that we knew only some could sustain. Knowing the course from last year, we decided to keep our strength for the hills and pick off some struggling runners along the way. The plan worked a treat! The first hill came at around mile one - it was a long slow incline, and already some of the more enthusiastic early runners were beginning to flag, so we took a victim or two here. The second of the hills threw up a few more victims and by hill number three we were comfortably running in the middle of the pack. While my legs were stiff from the cycle, I felt fine, and could have done with another mile or two to pass some more strugglers! 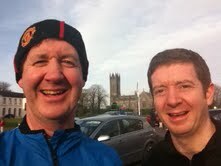 Cormac and I finished around 34.20mins. Richie, however, came in well ahead of us - fit man that he is, and Deborah was not far behind... Once again Mom walked the course in sprightly fashion, while Dad took care of refreshments! A very enjoyable run - I hope this stays on the race calendar for years to come. Day 3 Cycle Report - the Road to Stabannon. 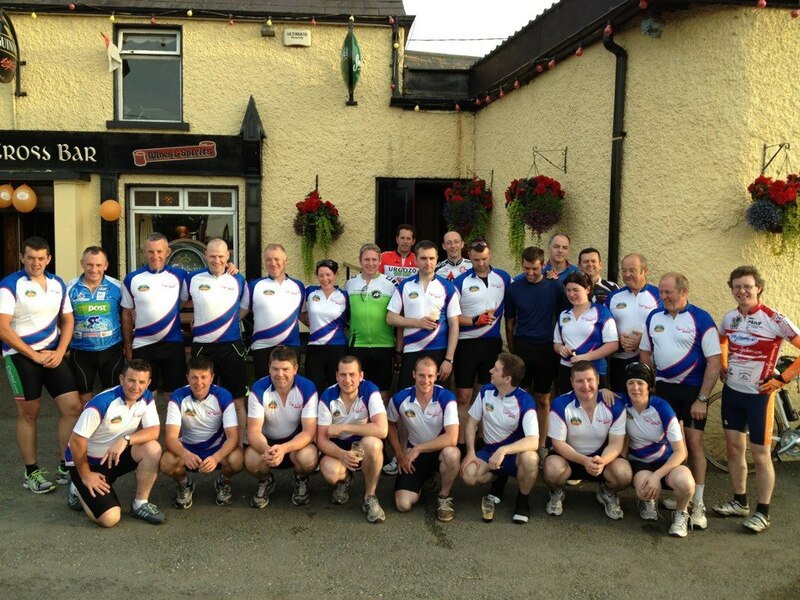 There we are - most of us, after arriving at our destination, Stabannon, 340kms and 3 days after leaving An Cheathrú Rua. Some of us awoke with very sore heads on Saturday morning last in Mullingar... I went to bed at an early hour, being knackered from two long days in the saddle, but reports at the breakfast table told of high-jinks until 5am from some quarters! I was glad of the early night, it left me in great form that morning. The final leg of the cycle was to be a 95k trek from Mullingar to Stabannon, via Delvin, Athboy, Navan, Woodtown, Ardee and finally Stabannon. 11 other cyclists joined up with us in Mullingar, so now we were a party of 41 (having one dropout from the previous two days). Sunblock was a must on that Saturday... it was one of the nicest days of the year - perfect for a homecoming! We broke up into two main groups again and the extra riders were divided out between the fast and slow groups. Whilst the road out of Mullingar was fine for awhile, the narrower road to Delvin, and then on to Athboy, became a real hazard with so many cyclists. Lines of traffic were held up behind us and some of the more insane drivers tried their luck at passing us out on the worst of spots. We were glad to see the back of those narrow roads when we finally got on the road to Navan. First off though: a brief stop in Athboy, 30kms in. And once more, some lovely cake from the two Missuses! Some of the 5am drinking crew were still nursing sore heads, but they were slowly coming to. The Navan road itself was a far safer cycle, and we really were ticking down the clock now to the finish so spirits were definitely high. 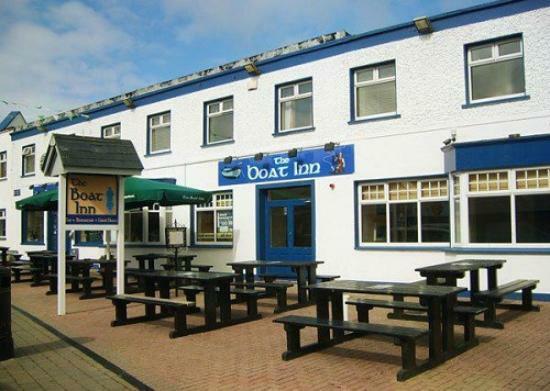 Word got out that we would be 'well received' in Woodtown (it being the seat of 'O'Donoghue's Bar', cousins of some of our main cyclists! So we got to Woodtown at about 4pm, with only around 25km of the cycle left, and sandwiches, sausages, pints and more all for hungry, thirsty and overexcited cyclists! 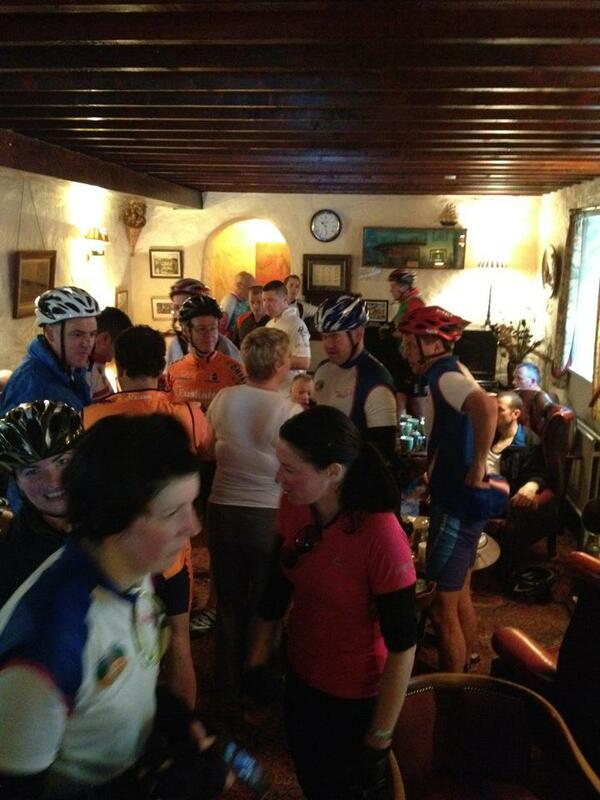 We were greeted there by family and friends, and were joined by another dozen cyclists for the last leg to Stabannon. The final part of our journey, from Ardee to the village of Stabannon, was a ceremonial jaunt, as we were joined by still more cyclists, many children amongst them. We still had about 10k to cycle but it was at a very leisurely pace and with great chat and cheer. Entering the village proper, after three days and 340kms in the saddle, was actually quite emotional. We were greeted by half the village and feted at the local pub - where we danced and drank until the early hours of the morning. What an experience, and what a fantastic event. I'm delighted that a daft idea that I had last year when I cycled solo across the country has turned into a serious event that seems set to raise in excess of 20k for a very worthy charity. Don't get me wrong - it's no great shakes on my part, the organising has of this year's event has been the genius work of others, but it feels good to have come up with the germ of the idea! Will we do it next year, or the year after - who knows? And then again, who the hell is going to stop us?????? 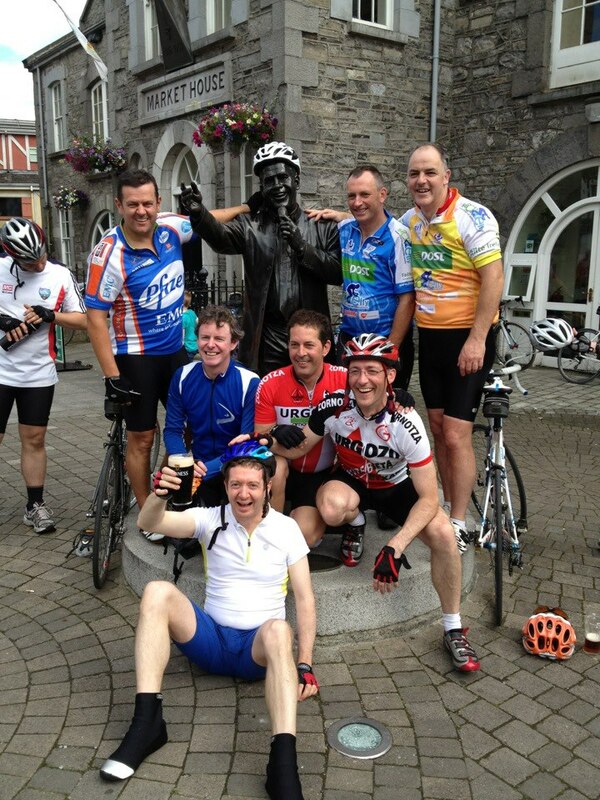 Destination for Day 2 was Mullingar, where I just had to toast a pint to the great Joe Dolan! Day 2: We left Carrick on Shannon at around 11 o'clock, some of us were stiff, sore and tired (namely me!) but we were excited and ready for the road. As was the case on day 1, we split into two groups - one slightly faster than the other, with the slower group going off ten minutes earlier. I nestled into the faster group this morning as I had spent the first day with them. From the Landmark Hotel (where we had spent a very comfortable night and ate like kings), we turned out the Longford Road, heading Edgeworthstown direction. Bums were sore. Legs were aching slightly! Our first stop was not due for another 40km so on we went without complaint. I was finding the pace a little too fast for me this day - the tiredness after day one meant that I was hanging on a little at stages, but still I was enjoying the crack. Cycling in a group is far different from my solo experience from last year. It works in a chain-like motion, whereby you pair up on the road and continue to change partners as you either go up or down the chain. It makes for a very sociable exercise - as I got chatting to all who were participating for a few minutes at least each day. At our 40km stop my good wife D and Ruth had sandwiches, cakes and you name it ready for us. We pulled in behind a Texaco garage in Longford Town... the sun was shining and all were feeling good. I made up my mind at this stage that I would swop over to the other group for the rest of our cycle down to Mullingar. The trip to Mullingar was fantastic... we had the hard shoulder all the way and I had the added extra of having 16 new riders to acquaint myself with! The pace in this group was far more manageable after a day and a half with the Tour de France crew so it was all good for me. Pulling in to Mullingar Town - our destination for Day 2, was fantastic. We had a good crew waiting for us there in their orange Jack and Jill t-shirts, collecting money in their plastic buckets. 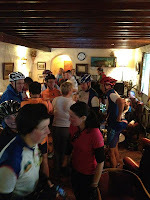 As for us cyclists- we rushed into Canton Casey's pub in the main square and had a well deserved pint! Only one day to go now! First Day of the Big Cycle Done! Our group was second to go and was marshalled by the great Mark Toner! This man can cycle - up and down through the group at will, helping those in need of a lift (yes I did at one time) and keeping a tight rein on those who were speeding away from the pack. The first section of the cycle brought us out the bog road to Camus, where we were encircled by the wonderful sight of the Maamturk mountains, and following a short incline after Maam Cross we positioned our bikes for a fantastic descent down to Maam Bridge - 30k done and the first of our stops. After a quick coffee - thanks to Keane's Pub and a certain someone who picked up the tab - we got onto our bikes again for the wicked ascent up Máimín an Ghabhair (Goat's pass). This is a very sharp and tough climb but the reward of the descent afterward is worth it - as is the run in to the beautiful village of Cong, our next little stop. From Cong we headed onwards into County Mayo, passing Ballinrobe and working our way to Claremorris. This would bring us to the 90k mark, a little past half way for day 1. My wife D, and Ruth, had driven on ahead of us and prepared sandwiches and cake for our lunch. The Garda (police) station was kindly given over by the local gardaí for this purpose. Everyone was feeling good at this point - we were well on our way. Following Claremorris we were heading to Knock (site of a Marian apparition in the 19century) and down to Ballyhaunis, then through to the little village of Loughglinn in Roscommon, 120km in. We stopped again here - our last stop before heading straight for Carrick on Shannon. At this point, most of us were feeling the pain - but it was close enough now to just plough on. We readied ourselves for the last leg of the cycle - taking a turn to Fairymount, where there was another severe climb, and then on through Frenchpark, turning right for Carrick on Shannon. What a feeling when we finally reached our destination! We were all joined at this stage - tired, sore, but very happy! As my cycle approaches I should be winding down the training with some light sessions - either on bike or on foot, but instead the weather has dictated that I take to the sea for some lovely swims... Trá Pháidín is a beautiful, secluded beach that can only be accessed through fields by those of us in the know, and it truly is a slice of paradise. Yesterday I left the house at 7.30pm with a little rucksack containing a towel, a book, and a transistor radio. When I reached my paraside destination I found two local women there already, basking in the evening sun. We three were in on the secret of this beach - the rest of the world lived in pure ignorance. The water was calm and clear, but the funniest thing was that a shoal of mackerel had come to the beachhead and were swimming around us as we waded through the water. 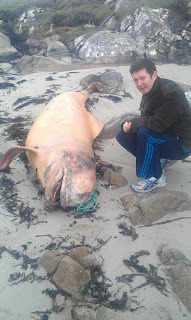 This happened to me in this very same spot four years ago... back then I rushed back to the house to get my fishing rod and proceeded to land two score mackerel, but yesterday I simply swam amongst them for an hour. 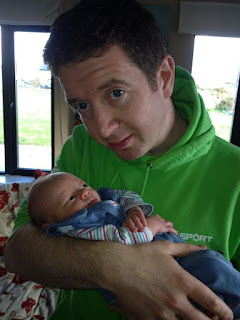 Tomorrow I'll be on hand to help Conor, as part of his crew for the Connemara Ultra 100. This will be his very first ultra marathon, but more importantly it will be his 100th full marathon. What an amazing achievement. As for my preparation for the big cycle that starts next Thursday - rest is probably key now. The Boat Inn, in the picturesque village of Oughterard, where I stopped off for a toasted sandwich and coffee, 45k into a 105k cycle. I'm developing bike legs at last. This past week has seen me up on the two-wheeler for an 80k, 40k and finally a whopping 105k cycle yesterday! In between all of this I managed to run a 5 miler and a 3 miler - but the cycling has slowed up my running progress for sure. Which pursuit do I prefer? Like asking to choose between strawberries or cheese, it depends on the mood... Cycling can be very difficult on our Conamara roads - especially the route back from the beautiful village of Oughterard (Uachtar Ard as we say in Irish! ), where I took a short break and had a sandwich in the Boat Inn. This is mountainy country - beautiful, but damn tough. The wind seems to always swirl against you - no matter what direction you are heading in. There are times of course when it is just directly in your face and forcing you backwards. I'm just a novice at this cycling lark of course - I've only recently learned to sit low against the wind - it makes a fair difference but can be difficult to crouch for a very long period of time. My 105k cycle went okay (believe it or not), but I did begin to tire at the very end. The first day of our cross Ireland trek will demand a 160k effort, so I still need to acclimatise. Beautiful scenery - tough cycling! The big event is only nine days away now - and the excitement is growing for sure. I'm well chuffed that a solo effort from last year is taking on greater significance this time out, with 30 other participants coming along for the three-day cycle to raise some much needed funds for the Jack and Jill Foundation. The credit for this year's success has to go to Teresa, Enda, Ronan, and all the gang up in Stabannon who are fantastic organisers. Of course, it's all in memory of a very special little girl, and for all the families who are struggling to cope with the illness of a very young one. www.rosescycle.com. 60k Cycle, 5 Mile Run. There are the Maam Turk Mountains - a sight to behold as I cycled out to Peacocks of Maam Cross. I'm a little weary today, but it's a good kind of weary - that of a man who is beginning to string some serious training together at last! I had Monday off, so that morning I hopped up on my bike for a 60km cycle from my home in An Cheathrú Rua out the Seanamhach Road to Maam Cross and back. I'm in high training now for my big cycle in a little over three weeks time, so I really need to start pushing the mileage. A word about the cycle: for anyone who has followed my blog progress this past year you may remember that nearly exactly one year ago I decided I would cycle across Ireland in three days to raise a little money for an organisation called the Jack and Jill Foundation (a group which helps parents of severly ill children in their struggle to cope with medicine and care). I basically did about three weeks of bike training (never having cycled before), threw a rucksack on my back and went off on my merry way. I was joined for some bits of the way by others but mostly did it on my own. This year I'll repeat the task, except for one small difference - I'll be joined from the off by 30 other participants! And we're all collecting money for the Jack and Jill Foundation under the name Rose's Cycle . Back to Monday: it was a wet and windy day but somehow it was grand on the Seanamhach Road. In fact I really put the foot on the gas on the way out and must have averaged around 27k per hour - which is fast for me! I got to Peacocks, the mid way point, in a little over one hour and stopped for a chocolate! The wind was slightly more against me on the way back but I maintained a good pace until about the 50k mark, at which point I faded slightly, but I'm happy enough with the effort overall. Yesterday I got out for a 5 mile run. The legs were pretty tired after my cycle and so I really couldn't get any kind of pace going, but I gently trotted up and down the village to cover the distance. I don't know if I should rest today or get out for a short cycle... we'll see! He's been away for a year, but the monk has finally returned. Yes folks, with just about four weeks to go before I get up on my bike to cycle the width of Ireland with 30 other brave souls as we attempt to raise €5k for the Jack and Jill Foundation, I have once again embarked on a journey of 'extreme' clean living! I started on Friday with a bout of starvation! Porridge for breakfast, no tea or coffee, a salad at lunch time and then nothing for the rest of the day, except water! Then at 7pm I drank some warm water with a spoon of epsom salts. I repeated this at 9pm and then, at 11pm, I drank 100mls of extra virgin olive oil mixed with the juice of a single grapefruit. This, my friends, is what we call a 'liver clense'! The salts collect the toxins and the oil and juice help to flush them out! And flush them out they did... The next day I eased myself back into some healthy veg and red meat and since then I've been gathering strength. Today I ran a 7miler with Conor and felt good. Now the real assault can begin. As for Conor - he is due to run his 100th marathon in three weeks time... and it will be an ultra one - a full 100miles. Ah... it's challenge season and I love it! For anyone who is feeling generous, you can donate to our cycle at www.rosescycle.com. My lack of posting is due to an internet problem we've been having at home, but I'm stealing moments now to report on a good(ish) week! Great Race at the Racecourse! I'm finally getting to post this blog - three days after the big event! Big Ron and his two musketeers picked myself and D up early on Sunday morning and we headed in to town for a 10k run which would start and finish at the famous Galway Racecourse. It was a bit of a rush getting there - Big Ron and I sprinted out of the car and into the registry office, practically togging out on the run in! He hadn't run competitively since last September, and I hadn't run a race since last January - so we were both a bit anxious to get at it. It was a gorgeous, sunny day and the turnout for the run was fair enough. My own intention was to trot it out easily, just to get a run out of the way. The Big lad was anxious to really test himself, so he went off like the clappers while I paced along nicely. This was a TOUGH course! Have I ever run a more upward 10k? There was one portion of the race, between the 4k and 6k mark that seemed to go up slightly for ages, with no downward at all at the end of it! Worse was to come at the 6.5k mark, with a steep uphill climb all the way to 7. The run from then on was just about okay! The funniest bit was the very last run-in - as if to emphasise the uphill nature of this race the run-in itself was up hill... now I know how the horses at the Galway Race Festival feel. Unbelievably, I posted a PB for this distance: 50.09mins. I know I would have gotten under 50mins had I been able to see the clock on the run-in but it was concealed until the very last second. Big Ron also posted a PB - an untouchable 42.45mins. Afterwards we had to rush back again home, but it was a very enjoyable race and culmination of a good week of training. Unfortunately this week has been too stressful to run so far, but I intend to change that tomorrow. Cranking it up... a bit! Not too bad this week... following the earlier run on Monday, I took to the treadmill for an interval workout on Thursday - I hate the treadmill but for some reason it isn't too bad for intervals (or repeats as some call them). I did a mile warm-up to start off with, then followed with three very fast miles, divided into segments of a half a mile at a time. The pace was pretty fast for me, but I knew I had to crank up the pace of my training at some stage. My next run was a five mile trot up and down the village on Saturday. I found this to be a bit of a slog to be honest. I know that I partly suffered because of the hot weather that day, but another part of the reason was down to the fact that I had eaten a BIG dinner just about an hour and a half before setting off. This eating before running lark is just not my style! I'm way off my pace at the moment, but at least I'm up and running. I feel that I'm not eating or training well, so both things need to be bucked up. I also NEED a race... and I believe Big Ron has found the answer with the Ballybrit 10k next Sunday. Finally, a goal! Five Miles in a Hippidy, Hoppidy Way. Great news on a personal front - D and I are expecting! We were in for a scan this morning - all is well! 9am isn't early, but for a Sunday morning it's not too bad! I was awake from 8 and sipping some coffee when I decided I'd get a good early run in. My fear was that the day would become too hot for pale skins like me, so there was really only a small window for a decent run. So out the door I went, down towards the lighthouse and then back around and up the village - 5miles in all, at about 8.40 pace. I felt the heat even at that early time... It took a wee while to get into any kind of stride at all but I eventually got accustomed to the day and began to enjoy myself.This was the first week in some time now that I've strung three runs together - albeit short distances (4, 2 and 5). However, lob a 25k cycle into the mix and it hasn't really been too bad. The country goes to the polls on Friday next to vote on the EU Fiscal Stability Treaty. What a joke. If we vote no then we'll probably have to vote again in a few months time to see if we can deliver the answer our politicians want and if we vote yes then we will have solidified our role as the lapdogs of Europe. I'm seriously toying with the idea of turning up to the voting booth and drawing a picture of an arse on my polling card. Animation terrorism. Yes folks, had George Harrison lived in Ireland in 2012 (and I have to say at this point that the great man had more than a wee dollop of Irish blood running through his veins), then for sure the verses of his classic song would have been spoilt by less dramatic adjectives than 'long, cold, lonely...'. The chorus, however, would have led to the same conclusion, for here, my friends, comes the sun! It is scorchingly hot in Ireland these days (some areas claiming up to 26 degree heat yesterday). So we're getting out there cutting lawns, licking ice lollies, clipping hedges, and getting bogger tans*. Some of us are running. Personally I can't run in the heat. So my choices are: get up very early in the morning (not happening these days), or else wait for the evening sun (same sun but without the attitude problem). Let's face it, I'm a pale skinned, freckly faced, redheaded (slightly red, greying a bit) Irish man - I wasn't made for mediterannean heat, but I'll take a week of it if it's going. I haven't posted here as often as I would have wished lately - these past few weeks have been hectic with other things: a family wedding in Louth and the sudden death of another friend (this is the third occasion this year - truly an annus horribilis). Her passing took a lot out of us all, she was a very special, beautiful person. It is time now to honour her memory and that of the others who have passed on by enjoying life in the way that she did. I went for a 25k cycle with Mark on Monday - absolute heaven. We circled Ros a Mhíl, looping back in to Carraroe. This was my first real cycle of the year and I enjoyed it immensly. This August I'll do my Conamara - Louth cycle again, and believe it or not I'll be joined by at least 20 others this year! On Tuesday I went out after work to run four miles on the prom. I hadn't run for nearly two weeks (longest gap for quite a long time) and if truth be known I was feeling the after effects of funeral and wedding drinkage (no such word but there should be), so I found this run tough. All the same it was enjoyable - it's hard to beat the prom for an atmosperhic run. Yesterday, I resorted to interval training on the treadmill! A sin, I know, in this fine weather, but I've been choc a bloc with house preparation (our students are coming in a week) so I felt it was the easiest thing to do (while trying to man the cooking station!). A decent long run this weekend could complete an ideal week! *Bogger Tan: a tan, unique to the Irish male, which consists arms being burnt up to the point where a short sleve shirt would have been! Particularly synonymous with the man who cuts turf(peat) on the bog! Bog cotton on Seanadh Phéistín... from last summer. Two things: 1) I need to change my runners, 2) I need to establish a better running routine. Not doing either of the above has seriously affected my running lately. Now, I know there is no excuse for me not to change runners but lately domestic bills have been given priority over my pavement pounding, with the result that I'm practically running on the soles of my feet along the hard concrete grounds of Conamara. I'm convinced that this is what gave me a sore hip two weeks ago, but idiotically I still haven't changed the bróga (Gaelic for shoes!). So, I promise to get a brand swanking new pair tomorrow, it being 'pay day'. Now, on the other front, I have even less excuse. I haven't strung a three-day week session in well over a month. In fact, for the past few weeks I have only run once. At least this week I have done two sessions, so please God I'll get out for a third on the weekend (with my brand swanking new bróga). Yesterday, Conor and I got out to Seanadh Phéistín for a seven miler. The man is flying! He will complete his 100th marathon this August, with a 100 mile run in Conamara, and is darting down to Limerick this weekend to compete in marathon number 92. I felt like a complete novice beside him as we climbed the gradiants of Seanadh Phéistín - him chatting away like an auld woman having tea and crumpets, while I grunted and groaned to the best of my ability! The greatest indignity came after the halfway turn when Conor declared that he would do some 'strides'. What are these strides I hear you ask? Strides, my dear, are when one runner decides to completely take the mickey out of the other!!! Yes, he literally took off at pace, sprinting four hundred yards or more, while I still jogged away in the distance behind him. And then he would turn around, jog back to me, and run alongside again for awhile. I had to pretend that I too could stride away like this if the notion took me... but the truth is that I was struggling to keep my snail pace going (I blame the bróga). Conor must have broken away five times during the course of our run back to the cross - taking off like a jet each time. 'Jaysus, you're goin well now', was about all I could say! Still... with new runners and a third session this week, I know I can get back some kind of dignity! After a wonderful weekend in Gaoth Dobhair, where Richie, PJ and I played a very enjoyable gig in Tí Hiúdaí (we finally got a genre we're comfortable with when one person described our music as punk country, then changed that to dirt country!... ), I got back to terra Conamara yesterday evening and was fit for nothing but stretching out in my comfortable bed. Today, however, I managed to get out for a four miler - up and down the village. I felt ok, not too bad at all, but I got caught in torrential rain. I thought about darting behind the Secondary School until the rain passed, but what was the point - it was better to be running in the rain that getting cold while waiting for it to end! Here's a serious point: I haven't raced for months. Not funny. I have to get a race soon to get me back onto the straight and narrow. There's more to life than dirt country. After a long stint on the sidelines, Big Ron finally made his running comeback on Tuesday, with a three mile trot around Bóthar Buí and Dóilín with yours truly. Weather was wonderful on Tuesday, so it really was a joy to run up this side of the village, with magnificent views of the mountains and the sea. Big Ron struggled a little coming up the hill from Dóilín pier and it was hilarious to see a supreme athlete such as he puff and pant in my wake. Of course I made the most of this, knowing it will take the Big Red One about three weeks of running to leave us all trailing in his dust again. 'I hope you don't mind if I finish up at the three mile mark,' said Burgundy. 'Wimp', I replied. I took the bulk of last week off from running. Following my glorious six and half mile comeback last Monday I felt a soreness in the hip area.... Now, it isn't often I feel a sorness in the hip area, so I was mightily alarmed. Was this my future staring me in the face? I spent four days crawling up our work stairs like a war veteran. Were my running years already catching up with me? Well, in panic I took the few days off and rested. Until yesterday, when I jaunted off around the village for three easy miles. No great pain, so hopefully that will be that with this aul hip pain. Probably time to change my runners! Conor and I went out for a six mile run yesterday evening and with time constraints we decided to run from the house, rather than take our usual drive as far as Seanadh Phéistin. What a revelation. Now, I do normally have a village route run but this time we decided to turn left down a tiny road called Demense. I know the road well from my youthful days of taking a shortcut to the football pitch, but for some reason or other I've ignored this route when it has come to running. The downside is that it can be rough underfoot, but it is spectacularly beautiful and remote. Of course the evening added a good deal to it - clear and warm. I've slipped a bit running-wise lately (I did run a four miler on Monday) and I've also slipped blog-wise. But, I'm back for sure?! Missed Marathon, Missed Blog Posts, Friend Passes. This was possibly the longest stretch between blog posts since I began this carry-on a couple of years ago. I should have been on to tell the story of my successful Barcelona marathon over a week and a half ago, but, alas, there was no Barcelona marathon for me - successful or otherwise. Our trip got cancelled when one of a party of three took ill. There will be other marathons - it's not the end of the world. My own training has dipped dramatically these past few weeks though, but I still got out about three times to trot around four/five miles. On Saturday another good friend of mine, Michael, passed away following a battle with cancer that lasted over a year and a half. He was much loved and achieved a great deal selflessly in his life. We will miss him greatly. We might also do well to learn from him. It's getting close to Barcelona now - just another week and a half until I'm trotting around the streets of that wonderful Catalonian City in an attempt to run 26 and a bit miles... Unfortunately the wheels came off my preparation these past few weeks - between catching a cold and general work upheaval, but I'll not allow the negative voices to get to me, I'm going to enjoy this marathon come hell or high water. Yesterday evening I went to Seanadh Phéistín for a six mile run with Conor. He'll also be running the Barcelona marathon, as will Míchéal. We were both a little dodgy going into yesterday's run - he had lost a couple of weeks of training also, but the six miles did us the world of good - if not physically, then certainly mentally! My plan now is to get another few mile in tomorrow, and then compete in the Craughwell 10 mile run on Sunday. Then it's pasta and rest until Sunday week! How true of today... finally Spring has come to Galway and brought with it a wash of colour, a slight increase in temperature, and a real stir in nature. I ran from Salthill after work - heading out towards Bearna village. This time, however, rather than running into the little village itself I turned right before the church and headed down to the gorgeous Silver Strand. 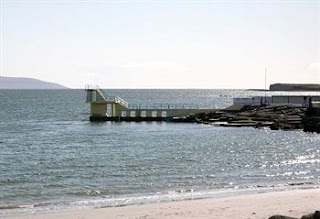 This is an interesting little beach - much smaller and more secluded than it's illustrious neighbour, Salthill, but popular enough to have a car park and proper toilets! Overlooking the beach, towards the town side, is a jut of a hill - a large grassy hill with the sides facing the sea cut straight and white with sand - like the hills of Dover! There are actually two of them, with another to the east - closer still to the city (you can see one in the pic above which I robbed off the net...mid right of pic...I'll bring my camera next time). These hills are strangely positioned, just on the water and resembling tall islands at times - I've seen them for years but it only occurred to me today that I might be able to run up one! So, like a child full of wonder, I crossed Silverstrand beach, climbed up the boulders that lead to the gammy fence the council have erected to protect people like me from ourselves, and then I broke through that fence and leaped onto the first of the hills! I was freeeeeeeeeeeeeeeeeeeeeeeee! Giddily I ran up the steep hill excited to see what I would see! And what did I see? A lovely level run and then a sharp dart downward to the otherside. The tide was outand it seemed that you could run from one hill to the other, and possibly cross back into town in a loop. Could it be done? On I ran, to find out! I came to an estuary, exactly in the middle of both hills and under my feet were a hundred thousand mussels... They were huge and all there for the picking. It's not the best time of year for mussels I reckon, but a bounty like this couldn't be left unpicked, so I stuffed the pockets of my shorts with a handful and then carried on. Unfortunately it wasn't possible to cross over to the other hill, so I turned back towards Silver Strand again. Coming to the top of the hill from the other side was like a scene from that old smaltzy tv programme Highway to Heaven - the sun was setting just at the top and a dog was hidden in it's golden rays until I came up close! Of course the mussels were rattling around in my pockets making it uncomfortable to run, so I left them atop a pillar on the road outside Silver Strand - to be collected on the way back. Later on I cooked them in a sauce of onions, tomatoes, garlic and a drop of white wine. Delicious. How did I feel running-wise? Who cares - on days like these the run itself is beside the point! A chocolate bar in the middle of a long run? Five miles into an eight mile run I decided to stop at a shop and buy a mars bar and a bottle of water. I slugged them both back and then trotted on home. Weird, I know. The new mars bar approach to running came about due to some bad preparation earlier! I had the day off, and had an inkling that I would do my 20 miler run, so I had a bowl of porridge at 10, fully intent on heading off on my run two hours later. But, following a cup of coffee up at the local café, and a cup of tea with Big Ron, I kept putting this mammoth run off. Eventually, I got out the door at 3pm - with pangs of hunger! Lesson one from today: if you don't fuel up properly you will weaken quickly! My route was basicially just around the village - from one tip of the peninsula to the other and back again. At Dóilín beach I decided to trek along the strand to where the old pier is, rather than double back up the road again. This route brings you to a raggedy old road that is serious incline from the old pier back to the main road again. I had brought a few quid along for fear that I might need to buy water somewhere during the long run but, as I trekked up that incline, I decided on two things: 1) I will not run 20 miles, nor near it! 2) I NEED CHOCOLATE! So, back to the village, into the local shop and, mars bar and bottle of water later, I'm on the last leg home... Still a very enjoyable run, and I'll live to fight another day on the old 20mile front. This, coupled with an interval on Saturday makes for a good enough past few days. The picture above is of a little whale that washed up on our local beach. The poor thing. I haven't been feeling the best these past few days, so I've reluctantly cancelled running appointments with Conor in the hope that I'd shake back into top gear. 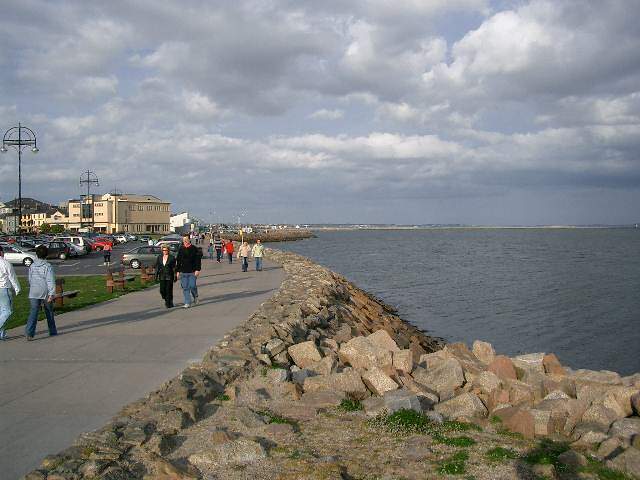 However, I couldn't afford to wait too long (marathon on the horizon), so I went for a run on the Salthill prom after work this evening. Just over five miles. 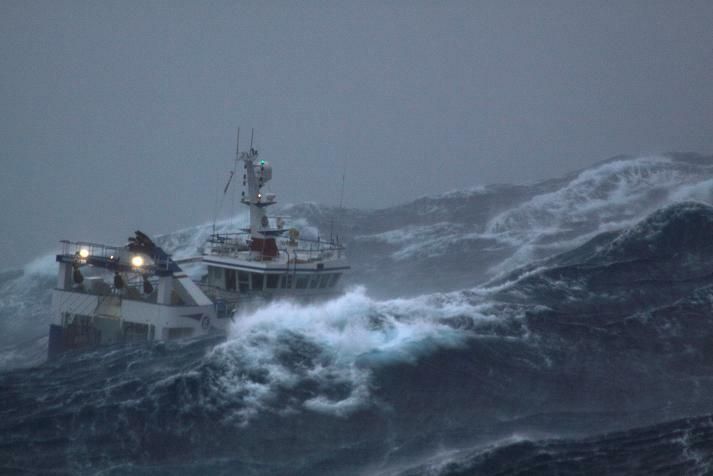 The weather was wild and the seas were very rough (I have exaggerated with this pic but, not far off!). I headed west against the wind on my way out. It's hard to describe this to non runners, but nothing, and I mean nothing, beats these kind of runs. On my way from work a colleague said 'better you than me - I wouldn't go outside the door in this weather!'... 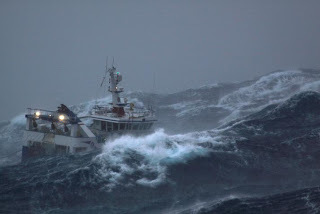 The only tough part is the getting out there, being out there is just fantastic. Five and Half Miles of Lactic Loosening! Following Thursday's 18miler I took a break on Friday and got back into the saddle (well, into my runners) for a 5.5 mile jaunt up and down the local village. This was TOUGH. My legs clearly have a mind of their own and they did not want to be out on the road yesterday, so soon after the 18 mile run. At every step they were screaming 'nnnoooo', On the other hand, my brain was well up for a run yesterday. It was a bright and beautiful February day - a real Spring day. For once Ireland seems to be getting the very best of Europe's weather. The big rugby match in Paris between Ireland and France was called off, while the English and Italians played on a snow covered pitch. Meanwhile, on this island I was running around An Cheathru Rua in bright sunshine! Now, why would the legs have any complaint about that? I'm not long back from a great 18 mile run - legs are sore, belly is slightly uncomfortable, fatigue is setting in but ooooooooooooooohhhhhhhhhhhhhh my God I feel great. Can you beat that feeling of actually conquering a long distance run? Just as I did for my last long run (16 miles a few weeks ago) I just togged from work and ran out of the city towards Bearna. This evening was a little drizzly and there was a slight wind in my face on the way out, but nothing too drastic. Strange for me to say this - but I've actually been listening to an ipod on some of my solo runs lately, and for a man who never listened to music while running, well, I'm warming to it. There was a specific reason for the ipod though - I don't have one of those garmins, so I've been judging my distance by time and checking it back on an ipod related measuring tool after! I'm normally bang on with time - my pace was 8.30ish so 18 miles would clock in between 2h 35 mins and 2h 40. And so it was! Anyway - back to the ipod... I listened to a few Gillian Welch albums, one after the other, when all of a sudden one earphone went kaput, quickly followed by the other (cheap earphones). It didn't bother me at all though - I'm still a no-earphone man in general. I was steady and strong for most of this run, though I did find it more difficult than the previous long run. The Barcelona marathon is a month and a half away - I've still got a good bit of time to strengthen the legs. There was nothing left in them by the time I reached my car this evening! My idea was to head off after work for a long run. See where the road would lead me. Only two weeks ago I did a 16 mile run using this very tactic - but it's been short distances since. So time for another long run. However, much to my annoyance I discovered that I had left my gear at home! My work is a long oul commute so by the time I finally reached home it was dark and definitely not long distance running time. Weighing it all up, I decided to swop a long session with an interval! So five miles of hard threadmill running was the order of the evening. And I did fine - survived anyway. The great thing about interval running (or repeats as some call them) is that they break the monotony of the threadmill. A straight run on that yoke is just sheer hell. Another big benefit of the intervals is that you do feel a different kind of buzz after these runs, and they certainly bring your fitness on a good bit. So, box ticked on the interval front - and the long road will live for another day! Misty Night on the Moors. Seanadh Phéistín is 100% bogland - or moorland according to Sherlock Holmes and other friends from across the Irish sea! So a night run in Seanadh Phéistin is a mixture of creepy and beautiful! This evening Conor and I stretched our legs for a five miler on that very moorland, with a gentle mist falling ever heavier as we left civilisation farther and farther behind us. We took it nice and easy this evening (I had done an interval session yesterday and Conor had done another marathon this weekend - so the limbs needed resting). Having said that, we did push it out for about a mile or so on the way back home. Despite my early dreams of following the furman programme for the Barcelona Marathon in March, I'm now just running as I feel - programme out the window! This may backfire completely, but hopefully I'll be fine... time will tell. My intention was to run 15 miles on Saturday or Sunday last. But I didn't. In fact, I only ran four. It was slightly demoralising - I have signed up to do a marathon in Barcelona at the end of March and yet I hadn't run more than 8 miles since the half marathon of December, until tonight. So today I brought my shoes and shorts to work and headed off from the Spanish Arch when the day was done. I had no fixed idea on how long I would run tonight, I simply ran on a whim. The night was beautiful - still and dry after a long day's rain. On I went, out past Nimmo's pier, around South Park, down to Mutton Island and then out onto the prom. I was feeling very confident at this stage - running a steady pace, certainly no more than 8.30mins. I ran to the end of the prom and turned left down onto the gravely path that hugs the diving board at Blackrock. There weren't any lights along this path and the way was now lit from the main road a couple of hundred yards away - but it was still clear enough to see directly ahead of me, and to my left the waves were crashing up against the shore. At end of that section of the run I turned left, heading down towards Knocknacarra cross, and then on out towards Barna village. It was a steady pace, and I felt good enough to determine to run on past Barna and keep going! I would actually have gone further but for the fact that there were no streetlights past Superrvalue and things were getting a bit dodgy! The way back was just as nice - I felt good all the way and probably could have run another few miles. So I've done wonders for my confidence - I now feel that I'm back in marathon mode - and I've done wonders for my motivation too. Real redemption. Great Day in Tuam - PB for Kevin! The epic year of a run a month started with the Tuam 8k twelve months ago, so it was only fitting that Kevin and I should return to the scene of that crime for another crack this year. I thought the race was next week, so I got a bit of a hop when Kevin called yesterday evening to ask if I was all set! I arrived earlier than Kevin and registered us both, and then headed off to a hotel in the town to read the paper and while away an hour. Kevin arrived from Mullingar at 1.30pm, and after a bit of warming up we headed to the start. 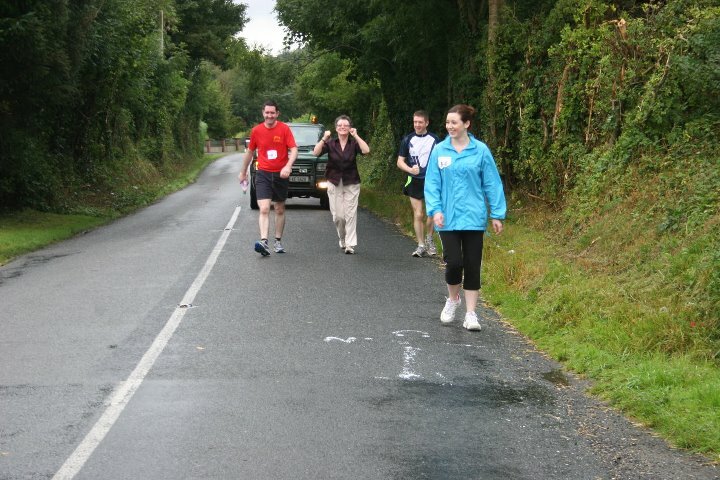 There were roadworks galore in Tuam so the regular 8k route was changed this year. All the better I reckon. For starters, last year's route was a double loop - I always find a doubler way more difficult that a single loop. There were slight inclines for sure, and I did hear some fellas in the locker room afterwards complaining about the difficulty but in all honesty both Kevin and I thought it was a far better run. And the day was a crisp and bright - if a tiny bit cold. Kevin and I ran this one together - stride by stride, and it really shows how far he has come in a year when he ended up taking over 3 minutes off last year's time as we strode in at exactly 42.00. We had a coffee in the Mercy Hall, where the Tuam club always put on a good spread, and then off for fish and chips in a nearby hotel - you can't get a better day! A New Blog for 2012. My posts have been tardy of late. There is a reason - and it's not that I've been lazy (I swear). I have a brand new challenge in mind for 2012, one for which I'm eager to dedicate it's own blog. I hope my few followers can switch over for the year (I won't be closing this blog down at all but posts for this blog will slow down a bit (maybe to once a week or so), and who knows, we might even gain a few more followers over the next few months... I'll certainly be keeping in touch with all my friends from Around the Year....More details to follow!